FROM THE LAB: Our next round of classes starts this week, Join Us!! We’ve spent a lot of time with the Ornament & Crime, examining many of the polymorphic modes including Piqued, Low Rents, Harrington 1200 and Quadraturia. One of the more popular uses for the module is as a pitch/cv quantizer in Quantermain mode, taking an incoming CV source and shifting the voltages to more harmonious scales. Quantizers take incoming voltages and shift them up or down to the closest multiple of 1/12th of a volt. When routed to a 1 volt per octave input, this produces the 12 semitones in the chromatic scale. By removing certain notes within that 1 volt range, we can limit the scale to smaller number of notes to form a traditional musical scale or mode. 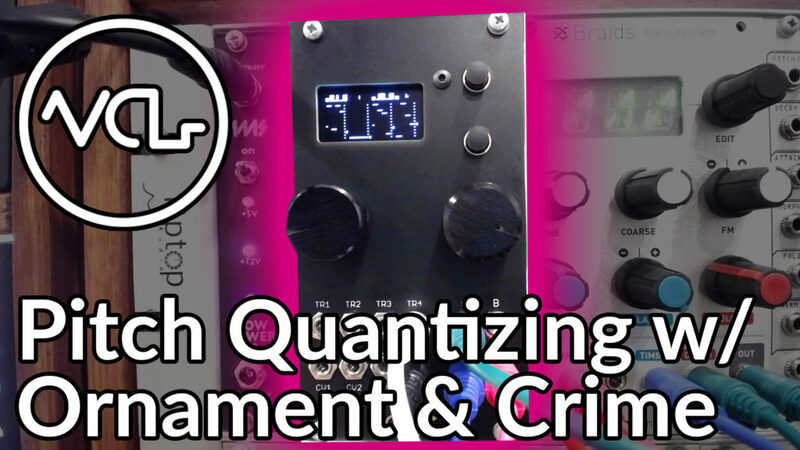 Quantermain is essentially a 4 channel sample and hold. Each channel operates in exactly the same way, with independent control over scale, clock division, CV and trigger source, transposition and more. When the scale mode is switched off, that channel will act as a traditional sample and hold with no additional tuning. When one of the 48 different traditional and world scales is selected, the held voltage is rounded up or down to the closest frequency that will fit into that scale. We can use this with any voltage source, but this functionality is particularly useful with unquantized sequences from stepped random voltage sources or sequencers. Using the DU-SEQ, which has roughly a 2 octave range of steps, the microtonal sequences that it produces can be shifted into a more traditional scale. For experimental music, of course, this may be undesirable. On the other hand, with 4 channels of independent scale control, things can get experimental very quickly. We’ll have more on Quantermain mode, including the quad Turing Machine functionality, in the coming weeks! We’re going to be starting our next Maths course (and others) very soon, Join Us!